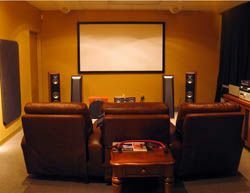 With the push of an A/B button in IHT's Orlando showroom, customers can hear the improvements that SymNet can deliver in their home theater.Many years ago during my tenure as an AV integrator, I was sitting in my office talking to my commercial Sony sales rep. He had just sold me my quarterly order of 3/4 inch Umatic video tape recorders and he said he had a surprise for me from their consumer video group. He dug into his case and out popped the first generation of miniature 8mm camcorders that had just been introduced to the market. Lo and behold he had a commercial version for our "side of the aisle" and it was identical except for the color. This was my first experience with the consumer/residential AV "tail" wagging the proverbial "dog" which for this metaphor includes the commercial integration products. Over the years those of us not subject to the NIH (not invented here) syndrome have come to expect that the consumer/residential segment of our industry would blaze new territory from a product development perspective and we on the commercial side would be able to take advantage of it. We can list numerous examples, but historically this goes back to the very first video projectors brought out by Advent in 1973. On the commercial side we did not really start to introduce the now long-lamented three-gun CRT projectors until the early 1980s. As noted above, the consumer manufacturers pioneered the development of miniature tape formats, not to mention remote control systems, flat panel televisions, digital audio, digital video, and advanced signal processing. Innovation still seems to start with the home cinema crowd and migrates over to the commercial side. Part of the reason for innovation by the consumer/residential manufacturers is market share and segment growth. Once an innovation takes root, nearly all suppliers follow suit. An equalization of the market takes place and product innovation is the differentiation that drives one manufacturer's product beyond another in terms of desirability. The continuous cycle of design innovation and implementation has taken us into the realm of "good enough never is". One such example is the migration to HDTV and the 720 versus 1080 resolution "wars". By the 240-line or 480-line standards, 720 lines is out of this world, but "good enough never is", so we have 1080. In digital cinema we have the 2K resolution standard but 4K is the next greatest thing. Most if not all of the developments we have come to expect in our everyday lives began with an engineer trying to better satisfy the consumers they serve and differentiate their particular product. If we look at today's market we see several relevant examples of consumer/ residential features and benefits driving the entire market, including the commercial side. One of my own personal hot buttons is image quality. On the commercial side we have fallen victim to the "cheap lumen" school of thought where we throw a lot of light at a matte white screen and feel this is good enough. Of course this goes back to the days of 130-lumen light output three-gun CRT projectors that were dim at best. Somewhere along the line image quality did not remain the first order and light output did. Meanwhile, on the consumer/residential side manufacturers sold image quality and marketed an appreciation for a perfect picture. The search for the "holy grail" of a perfect picture begat the art and science of display calibration. The Imaging Science Foundation began their quest back in 1996 and has trained thousands of technicians to properly adjust displays in a home theater. In the last two years, ISF Commercial has picked up the mantle and is now doing the same for the commercial industry. Suffice it to say, companies like Pioneer, SIM2, and projectiondesign have made their reputations on the high-quality images of their display devices. In the recent past we have seen the consumer crowd champion true native 1080 HD while the commercial guys have been mired down until recently at 1366x768. On the consumer/residential side, HDMI is the connection of choice and others are just now catching up. A couple of years ago we saw the first LED backlights for an LCD display and the increased contrast was outstanding. This is yet another consumer/residential innovation that will become commonplace across all segments. Similarly, Blu-Ray players are now finding their spot in the commercial world as content catches up to consumer/residential. Last but not least, companies like Lumigen and DVDO have introduced us to signal processing and scaling at the highest levels, making sure that the signal and resolutions are maximized as they interact. The examples of the "tail wagging the dog" are too numerous to mention in one article but rather than carrying on a classic Hatfield and McCoy type feud between segments let us all stop for a moment and pay homage to the launching pad of innovation that has historically been the driver of our audiovisual market and be grateful for those gifts.